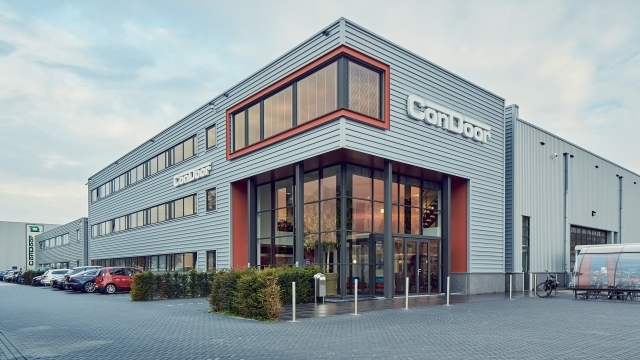 In Europe, ConDoor Door Solutions is a leading producer of insulated overhead doors for industrial and residential buildings. In three production locations in the Netherlands and Hungary, every day approximately 175 people work on the development and production of tailor made doors that completely satisfy the end user’s wishes. An extensive network of independent dealers delivers our quality doors (under their own name!) to companies and house owners in 25 European countries. A hyper-modern production line and extensive automation in the area of R&D, production and administration contribute markedly to the quality of our product. Even so, ConDoor still believes that people are needed to supply and deliver doors. This is because only people can recognise what other people want. And then translate what they want quickly and successfully into innovative solutions and competitive products. That is the way ConDoor works. Will it also soon be working for you? The management team from left to right: Kees-Jan Honig (DGA), Gerda Westhof (Finance), Gert Baan (Automation), Rik van der Vlugt (Sales), Jaap Kwant (DGA), Bart van de Steeg (R&D / Procurement) and Marcel van de Braak (Production / Logistics). Green choices, we make them every day. After all, green is good. And that is certainly the case for truly green energy. ConDoor made a conscious decision to use green energy (wind energy, solar energy) instead of the traditional grey energy (nuclear energy, gas- or coal-fired power plants). The production of green energy emits considerably less CO2. The result: green energy has hardly any negative impact on the environment and our climate. Watch our company film and get an impression of who we are and what we do.